Over the past half century or more, the historic heart was torn out of Tamworth, by planners eager to modernise an old market town. In the process, much of the legacy of the narrow streets and Tudor shops was lost. Most visitors in search of the past in Tamworth visit Tamworth Castle, Saint Editha’s Collegiate Church, and the Town Hall on Market Street, and perhaps also Guy’s Almshouses and the Assembly Rooms on Corporation Street. However, the Moat House, the Comberford family’s former Jacobean townhouse on Lichfield Street, is in a sorry state of abandoned dereliction at the moment. 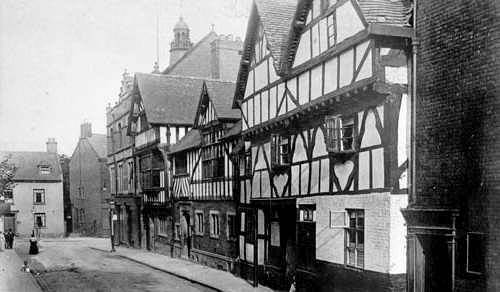 When people decry the destruction of Tamworth’s architectural legacy, they often cite the loss of the old Paregoric Shop and a row of 14th century timber-framed houses opposite Saint Editha’s Church in Church Street that were demolished in the 1960s. In my recent walks around the streets of Tamworth in the last few weeks, I have tried to photograph the churches and chapels of the town, the Town Hall and Guy’s Almshouses. But in places I have also found surprising legacies from the town’s once-elegant Tudor and Georgian architecture. Almost opposite the Moat House, No 92 Lichfield Street is a Grade 2 Listed building that was built in the early 19th century in the Georgian style and it is now in offices. It is a three-storey house, built in brick with ashlar dressings, a tile M-roof and brick end stacks, with a double-depth central-staircase plan, and a symmetrical three-window range. The ground and first floor have sill bands, there is a top cornice, and there are coped gables. The round-headed entrance is up three steps and has a doorcase with pilasters, entablature blocks and an open pediment, with a fanlight with intersecting glazing bars over a six-fielded-panel door. The windows have rubbed brick flat arches, those to ground and first floors are over 12-pane horned sashes. The second floor has windows with sills and casements. There is a rear brick cornice and a 20th century single-storey addition. Inside, there are some shutters to the windows and a stick-baluster stair. The White House at No 93 Lichfield Street was once part of the Moat House estate. The street frontage is in Georgian style with many alterations in the late 20th century, and much of the building dates from ca 1810, although it may incorporate parts of earlier buildings on the site. This is two-storey Georgian-style house, with an attic. There is a six-window range, with two windows in a forward break to the left end, and a gable to three windows to the right of this. At the top there are modillioned cornices to either side of gable. The round-headed entrance to the right of the bow window has a doorcase with pilasters, entablature blocks and a plain open pediment, and a fanlight with ogee glazing bars over the six-panel door in panelled reveals. The two-storey bow window to the left end has rustication and pilaster strips on the panelled plinths to both floors, an entablature on slender brackets to the ground floor, a continuation of the top cornice on slender brackets to the first floor, and both have three 12-pane sashes. The ground floor to the right has three windows with 16-pane sashes and one with a 12-pane sash to the right end. The first floor has three windows with 16-pane top-hung casements and flanking windows with 12-pane casements. The attic has 6:8:6-pane casements to the gable. The rear has a 20th century range and wing. In the 20th century, this was the Miners’ Welfare Club and Institute, but in recent years it has been converted into apartments and offices. The Manor House at No 95 Lichfield Street is another Grade 2 listed building in Tamworth. The Manor House is now in offices but was formerly the residence of a Tamworth GP. It stands on the site of an earlier house that was home to generations of the Vaughton family who played prominent roles in the life of Tamworth. They included bailiffs, chamberlains, churchwardens and holders of official, civic and church offices. In 1652, the widowed Anne (Vaughton) Guy returned home from Southwark to Tamworth with her children, and so this house is said to have been the boyhood home of Thomas Guy. He was the founder of Guy’s Almshouses in Tamworth and Guy’s Hospital in London, and also built the Town Hall in Tamworth. The Manor House is an early 19th century remodelling of an earlier house, with 17th or 18th century origins, or perhaps even earlier when it was part of the Mat House estate and the Comberford family was claiming the Lordship of Tamworth Manor. The house is built of brick with ashlar dressings, and has a hipped tile roof. It is a two-storey house built in the Georgian style, with a double-depth central-staircase plan. It is a symmetrical five-window range, with two windows to each end in forward breaks. There is an ashlar plinth, a ground floor sill band and a top cornice. The entrance is up three steps to a doorcase with an architrave, a fluted frieze and a consoled cornice, and an over-light to the six-panel door. The windows have rubbed brick flat arches, and those to the ground floor are over 12-pane sashes. The first floor has windows with sills, and 12-pane top-hung casements. The end small single-storey wings have entrances with doorcases: the one to the left has a stone-coped parapet, while the one to the right has a segmental-headed window with a 12-pane sash. The rear has an architraved entrance with large windows to the forward break to the left with 12-pane sashes. Further east along the north side of Lichfield Street, the Tudor House at No 111 is just a few steps from both the Moat House and Tamworth Castle. This is now a café, and with its centuries-old Tudor architecture it claims to be the oldest shop in Tamworth. Nos 110 and No 111 Lichfield Street are listed together as a Grade 2 building. They were built as one house, and this was later subdivided in two. The building dates from the late 16th century or the early 17th century, with later alterations. It is a timber-frame building with brick infill and 19th century rendering and refronting to the left half, and a steep hipped tile-roof with a brick stack to the rear of the ridge. This is a two-unit plan with cross-wing and a small addition to the right end. The jettied first floor, which is familiar and much-loved part of Tamworth’s streetscape, has exposed timber framing to the cross wing at No 111. The ‘hall’ range at No 110 has shop windows flanking the entrance with a canopy over and the left end has a segmental-headed entry. This is now a barber shop. The 20th century shop front to No 111, with a former entrance, is glazed, with a small wing to the right end. The first floor has 20th century casement windows, one blind window to the left of the cross wing and a small square light to the end wing. The rear has a projecting cross wing. Inside, No 110 has exposed wall posts, No 111 has stop-chamfered beams with exposed joists, and the roof has heavy collar trusses. Around the corner, on the north side of Aldergate, the Peel offers four-star guest accommodation, and there is a modern bistro restaurant and bar at Christopher’s. No 14 Aldergate and the attached outbuilding is a Grade II listed building. This was built as a Georgian house ca 1800 with recent alterations in the 20th century. It is built of brick, with a slate roof with brick end stacks. The building has a double-depth plan, is three-storeys, and has a symmetrical three-window range, and at the top there is a modillioned brick cornice. The ground floor has a 20th century projecting shop front extending the entire width of the building. The windows have sills, and there are rubbed brick flat arches over 16-pane sashes, although some glazing bars are missing. The second floor windows have eight-pane sashes. The rear of the building has two gabled wings, including a mid-19th century workshop, with an L-plan with segmental arches over the small-paned iron casements and extends to rear of grounds to No 15. Beside Christopher’s, the three-storey house at No 15 Aldergate, which was converted into flats in the 20th century, was built ca 1770. It was built in the Georgian style in an L-plan in brick and has a tile roof with brick end stacks. This Georgian house is symmetrical, with a three-window range and at the top there is a modillioned wooden cornice. The entrance has a door-case with pilasters, frieze and pediment, and a narrow over-light over the 20th century fielded-panel door. The windows have sills, those to the ground and the first floor have rusticated wedge lintels over 12-pane top-hung casements, although the window the ground floor right has lost its lintel and there has been rebuilding to the left. The second floor has six-pane top-hung casements. The rear of No 15 has a gabled wing, with two elliptical-headed carriage arches and a 20th century canted oriel. Nos 13 and 15 Gungate may have been built originally as a shop but is now a well known public house, the Sir Robert Peel, and is undergoing some rebuilding at present. This building probably dates from the 17th century, with additions in the early 18th century and in the mid-19th century. It is built of painted brick with an L-plan, and has a tile roof with a brick cross-axial stack. It is a two-window range, single storey building with an attic. The entrance is between two large 20th century small-paned bow windows. The attic has two gabled dormers. There is a rear gable wing, and a 19th century, two-storey, two-window range to right. Inside, the chamfered beams are an indication of the earlier date of this building, despite its exterior. So, these seven buildings show how the architectural heritage of Tamworth is spread throughout the centre of the town, is far more extensive than many visitors realise, and much of it predates Sir Robert Peel's political career in Tamworth in the 19th century.